Adam Johnson was jailed last year. Former England footballer Adam Johnson has been filmed laughing in prison while discussing his conviction for sexual activity with a 15-year-old fan. 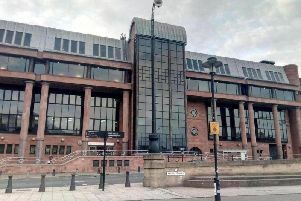 Johnson was found guilty last year of sexual activity with a child in relation to meeting up with the besotted girl in his Range Rover in County Durham in January 2015. At the start of his trial at Bradford Crown Court, Johnson admitted one charge of sexual activity with a child, relating to kissing her. He also admitted a charge of meeting a child with intent following grooming her. In footage obtained by The Sun he is seen sitting in what appears to be a laundry room of Moorland Prison, South Yorkshire, when he is asked by someone: "It's not like you raped her or owt like that?" Laughing, he replies: "No, I wish I did for six year." Last month Johnson lost a challenge for permission to appeal against his conviction and Court of Appeal judges also rejected his bid for a reduction in his six-year jail sentence. The former Sunderland and Manchester City winger is also heard saying he believes he was brought to court and handed a long sentence because he was in the public eye. A Prison Service Spokesperson said: "We are committed to making prisons places of safety and reform and are stepping up measures to find and block illegal mobile phones. "Those who break the rules will be punished and can face extra time behind bars. An investigation is underway."